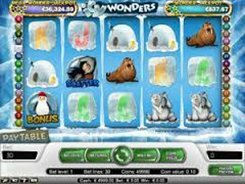 Icy Wonders is a progressive video slot based around an Arctic theme. To be eligible for a progressive jackpot, you do not need to play on the maximum bet. 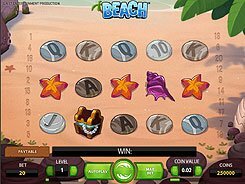 You can bet anywhere from $0.01 up to $60 and still qualify. The slot is played over 5 reels and 30 paylines. All symbols relate to the theme, and even playing card symbols used in the game appear as colored letters encased in a block of ice. To win a progressive jackpot you need to hit four or five Stars. If you roll up 4 stars, you will win the Wonder Jackpot. If you hit 5 stars on the reels, the Mega Wonder Jackpot will be transferred to your account. Along with the progressive jackpots, Icy Wonders features a wild, a scatter, free spins and a funny bonus game. A wild symbols is the biggest payer in the game, with five of them awarding up to $15,000. When playing the slot, you can take advantage of up to 30 free spins unlocked by 3+ scatters. There is also a bonus game activated by three Penguin symbols. On the second screen, you will be presented with a pack of penguins. You get to keep picking them and reveal prizes until a penguin of your choice reveals a fish skeleton that ends the bonus. PLAY FOR REAL MONEY!